Hauoli Makahiki Hou! 1906 / 2014. Wishing you all a very happy 2014. 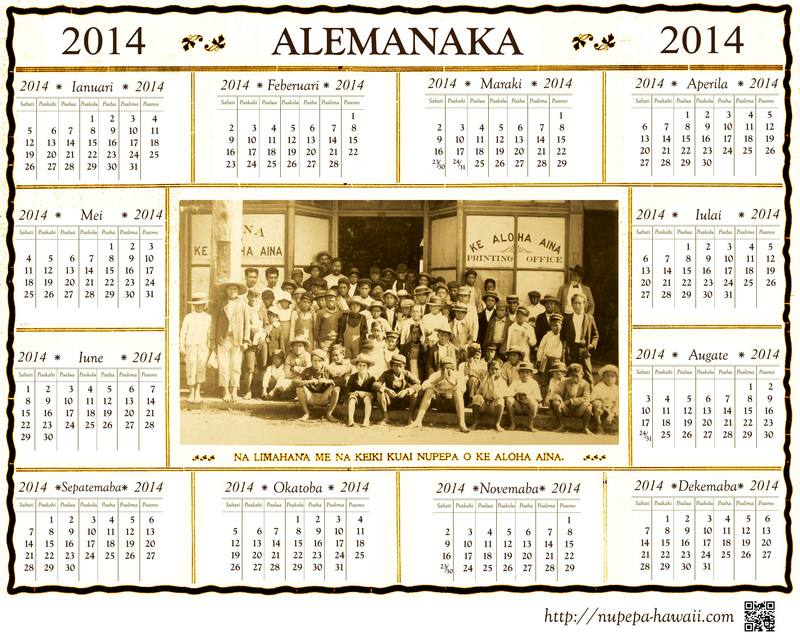 This calendar is fashioned after the one given by the newspaper Aloha Aina in 1906 to its readers. It features a picture of the typesetters and the paperboys of the newspaper taken on December 30, 1905. Please feel free to save it onto your desktop and print it out and put it up on your wall or give it away to someone who you think will appreciate it! 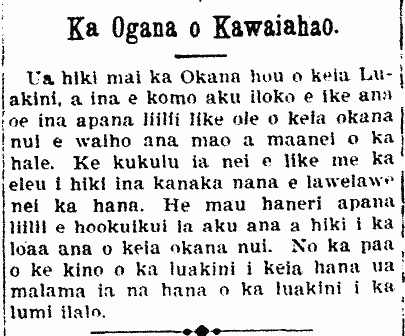 Birthday of Queen Kapiolani, 1876. Yesterday, December 31, was the birthday of the Alii, Queen Kapiolani, the royal daughter of Kuhio (m) and Kinoiki (f), and this made her forty-first year, for she was born on this day in the year 1834. Yesterday at 12 noon, she saw in Iolani Palace all those who came to see her and to give her joy on this proud day of a person’s life, and the cannons were shot off in salute for her birthday. Just as with the happiness and the congratulations of those who went to see her, so too are we who are outside, with prayers for blessings from the heavens that her life may be extended until extreme old age. Keawe dwelt with Lonomaikanaka; Kauhiokeka (f) dwelt with Keawe (m); Kekaulike (f) dwelt with Kepoomahoe (m); Kalanikauleleiaiwi 3 [?] (f) dwelt with Kanekoa (m); Pomaikaulani (f) dwelt with Elelule (m); Kuhio (m) dwelt with Kinoiki (f); born was Kapiolani (f), Kapooloku (f), and Kekaulike (f). Long live the Queen, Kapiolani. Ka Nupepa Kuokoa, Buke XV, Helu 1, Aoao 2. Ianuari 1, 1876. Maria Whitney Pogue passes, 1900. THE FIRST HAOLE GIRL TO BE BORN IN HAWAII NEI. Santa Clara, Apr. 20. This morning Mrs. Maria Whitney Pogue, the first haole girl to be born in the Hawaiian archipelago, died after a long illness. She was eighty years old. 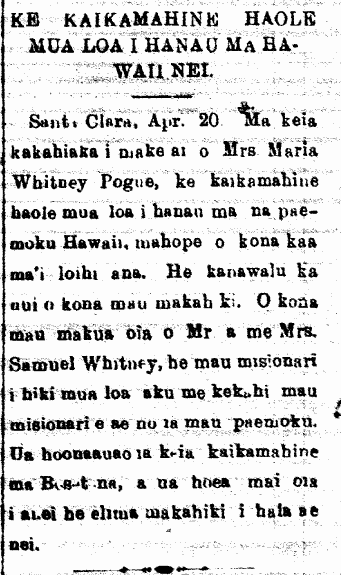 Her parents are Mr. and Mrs. Samuel Whitney, missionaries who arrived first with other missionaries for the islands. This girl was educated in Boseton, and she came here five years ago. Ke Aloha Aina, Buke VI, Helu 18, Aoao 6. Mei 5, 1900. Strange fish in Honomalino, South Kona, 1865. On the 26th of December, a very strange fish washed ashore at Honomalino, South Kona, Hawaii, and was found by a little girl. The length of this fish was 18 inches, and the width was 9 inches. When cut square, it looked flat. Some people have said that the name of the fish is Hoana. Its mouth is like that of a humuhumu. Its eyes, and dorsal fin, and gill plate look like that of an Ahi or and Aku, and it was eaten up by Mahoe. Three more of the very same type of fish came up at another place in Hoopuloa. How wonderful is God’s work. 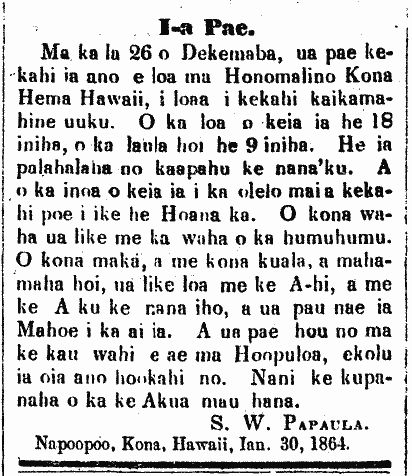 Napoopoo, Kona, Hawaii, Jan. 30, 1864. Ka Nupepa Kuokoa, Buke IV, Helu 5, Aoao 3. Feberuari 2, 1865. Near tragedy on the way from Kauai to Niihau, 1864. O Kuokoa Newspaper; Aloha oe:—Perhaps you and your Editor can be tolerant and include this in a Column of your entire stout body, about a crisis at sea, like this: Several skiffs left Niihau for Kauai, in Hanalei, to peddle goods; they did not face the crisis during this trip because the winds were calm on the sea, however, the next week they made ready to return, that being Thursday, the 12th of May, but because the wind was growing stronger, it wasn’t appropriate to continue the travels, therefore they landed at Nualolo that day, and stayed there for those days; and on Saturday, the 14th, they made to return here to Niihau while knowing the activity of the wind was bad; perhaps it was because they felt that the skill of the Niihau youth would not be acclaimed should they return in the calm, so they were worked up to sail, but after leaving and reaching the middle of the deep seas of Kaulakahi, one of the skiffs was pounded by a billow, and it overturned, and they were in dire straits. And when the second skiff noticed that this one had sunk, they threw their belongings into the sea and went to save the lives of the people overcome by calamity. The number of people aboard that vessel that had sunk was 13 including a small, young child who wasn’t yet crawling; I felt sorrow when I heard of this tragedy. As for the skiff that sunk and all of their cargo, it is all gone into the depths of the ocean, and all that was left are their lives, and what they had on; and God was patient with them and they landed on the east side of Niihau nei, in the place called Kii. 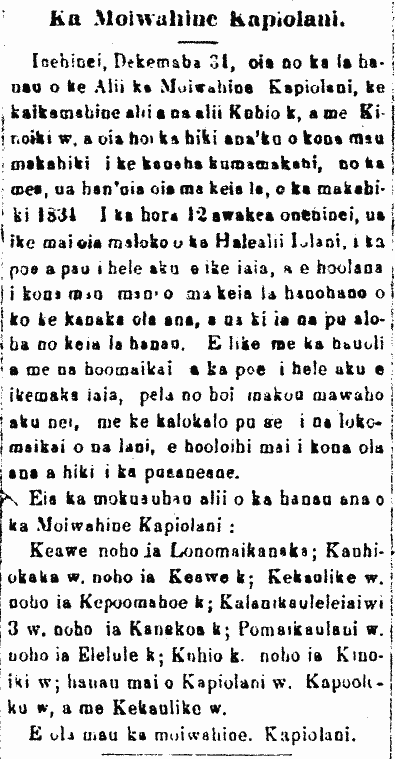 Kihalanui, Niihau, May 21, 1864. ¹A play on alamihi crab which can also sound like “path to repentance”. ²A play on the name “Hoolehelehekii,” meaning to be all talk. ³A play on the name “Laumihi,” perhaps meaning much remorse. ⁴P. R. Holiohana is most likely also known as P. R. Holi. Ka Nupepa Kuokoa, Buke III, Helu 25, Aoao 4. Iune 18, 1864. Wind and Rain and Lighting, oh my, 1863. On the 13th of Dec. and that night, a very strong wind appeared, along with rain, here in the town of Lahaina. When it came, we were sleeping in our beds, and I was startled by the great roaring of the wind shaking up the whole house. I heard the voice of my sister call out, “It’s a huge wind! It’s a huge wind! !” The buffeting winds passed and following it came heavy showers and Lightning flashing in the west. The strong winds which appeared here in Lahaina blew against the houses but did not blow any of them down. There were however three ships in the harbor of Lahaina that night: the double-masted Emma Rooke; the Molokai, the double-masted ship of Kamaipelekane; and the Luiki, a single-masted ship. The double-masted Molokai was the ship that was dragged ashore at Puupiha and which broke up into pieces. The wind did not blow very long that night and it abated as night became day. In the morning, I sailed aboard the single-masted ship to go sell awa; the strong winds reappeared and the anchor of the ship was pulled up. The captain made quick to sail. The double-masted Emma Rooke remained, but because of the terribly strong winds, it weighed anchor and made quick to lie off outside. Aloha by-and-by. Ka Nupepa Kuokoa, Buke II, Helu 52, Aoao 3. Dekemaba 26, 1863. New organ being assembled at Kawaiahao Church, 1901. The new Organ of the Church has arrived, and if you go inside, you will see all sorts of small parts of this organ strewn here and there of the church. It is being assembled as quickly as possible by those working on it. There are hundreds of small parts to be put together until the large organ is complete. Because the church is being taken up by this activity, the church activities will take place in the room below. Ka Nupepa Kuokoa, Buke XXXIX, Helu 28, Aoao 4. Iulai 12, 1901.